It is one of the Arabic states which located in the Arabic Mashreq and it Forms Separately The eastern part of the geographical & historical environment which is called " Al Hilal Al- Khaseeb" ..
Iraq lies in the west south of the Asian continent . And to the north of Kuwait & Saudi Arabia, to the south of Turkey, to the east of Syria and Jordan and to the west of Iran. Iraq has more than one seaport on the Arabian Gulf but the most important is Umm Qasr. And it is one of the Arabic Gulf states but not member in the Gulf Cooperation Council. » Mountains in the northeast on the borders with Iran and Turkey, with the highest peak reaching 3,611 m.
» Desert in the southwest. 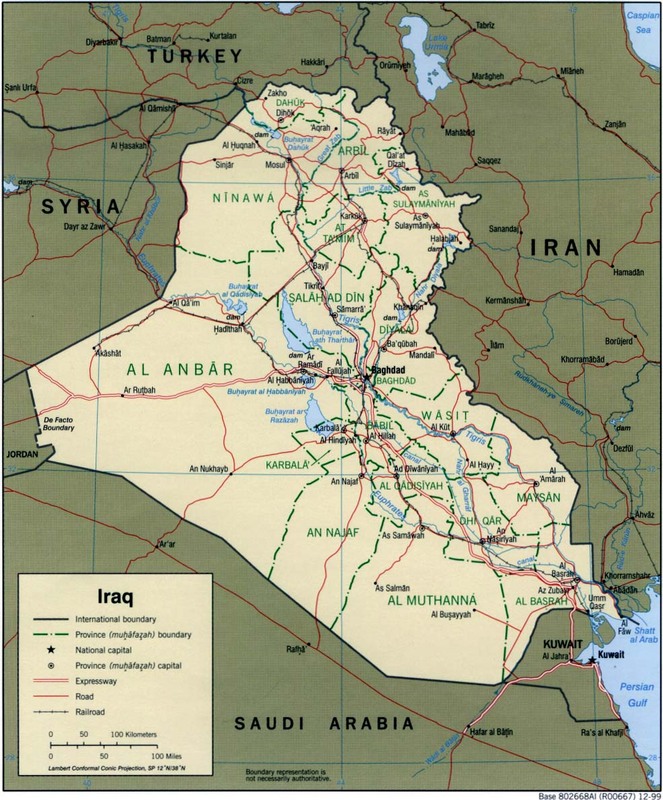 » Between the two is the heartland of the country, a fertile lowland region watered by the Tigris and Euphrates rivers. The two rivers converge into the Shat-al-Arab waterway and finally fall into the Arabian Gulf. Major Fruits Produced: Pomegranates, grapes, apples, figs, peaches, apricots, walnuts and watermelons etc. Executive Authority: The executive authority of the republic comprises of the President and the Cabinet headed by the Prime Minister. Legislative Authority: The federal legislative authority comprises of the Council of Representatives and the Council of Union. Judiciary: The federal judiciary comprises of the Supreme Judiciary Council, Supreme Federal Court, the Federal Cassation Court, the Prosecutor's Office, the Judiciary Inspection Department, and other federal courts as organized by law. National day: July 14th, Army Day: 6th January, Labor Day: 1st May, 21st of Nauroz (start of Persian New Year), New Year: January 1st. Important Religious Holidays (Follows the Islamic lunar calendar): Eid-al-Adha: Four days feast of sacrifice Eid-ul-Fitr: three days of celebration marking the end of Ramadan Islamic New Year: 1st of Muharram. Aashoora: 10th of Muharram. Eid Milad-un-Nabi: 12th of Rabi-ul-Awal.